Maybe this sounds familiar: one day an isolated Insupiat Eskimo village in northwestern Alaska is plugging along like everything’s fine. Then, out of nowhere, the town is attacked by a horrifying orange goo washing up from the ocean. Okay, maybe it wasn’t quite that dramatic, but it did indeed happen. Kivalina, a town of 425 that sits on Alaska’s coast 625 miles from Anchorage, flashed into the national spotlight a few days ago when reports came of a mysterious orange substance covering Kivalina’s beaches. The slimy growth appeared anywhere there was water, including the town’s lagoon and isolated areas like rain buckets. Initially, no one was sure of what the substance could be, although given Alaska’s history with oil spills, the Coast Guard was quick to rule out it being a manmade substance. Today the mystery has been at least partially solved. The National Oceanic and Atmospheric Adminstration threw samples of the goo under a microscope and it turned out to an aggregation of millions of tiny little eggs. NOAA officials said the eggs have little oily deposits inside, which may have helped them float and stick together. Outside of that, goo questions abound. 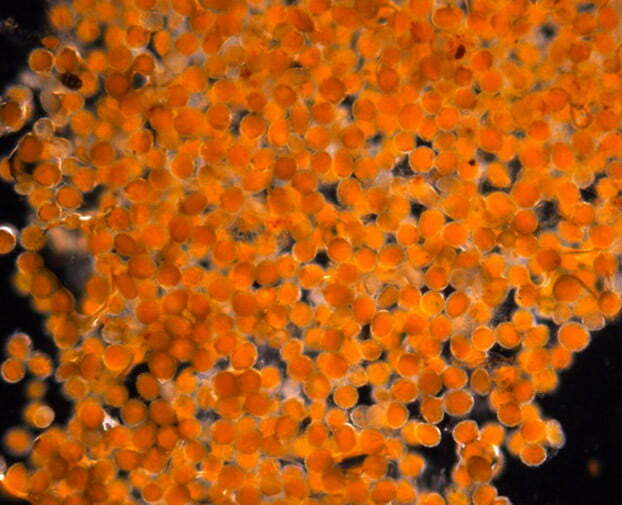 First, no one is sure whose eggs they are, although the current best guess is they came from crustaceans. Ongoing studies should solve that riddle relatively quickly. More worrisome for the residents of Kivalina are the residual effects the egg swarm will have. It’s unclear whether or not the eggs could be harmful to marine life, which the town subsists on. Furthermore, lest anyone think to market a new type of bubble tea, no one is sure if drinking water can be contaminated by the eggs, or how harmful they might be. Finally, as the eggs dry they turn into a fine, aerosol powder, which could cause all kinds of problem for land-faring wildlife as well as Kivalina’s residents.